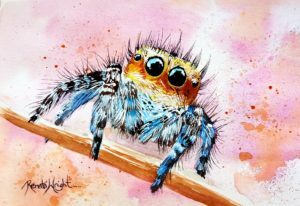 If you are fascinated by spiders and have a soft spot for pigs, you’ve come to the right place! I guess they’re a strange combination, but there are a few reasons why I’ve chosen these two subjects to paint. Firstly, I find spiders fascinating, and have done since I was a child. Did you ever have story books about the little creatures that live in your garden? With pictures of spiders and beetles and butterflies with their families, making homes in mushrooms, and having conversations with one another? I had a number of those books. It was a lovely fantasy world to live in. Now as an adult, I still find the “little” world fascinating, and have discovered that there are more arachnids in the world than just redbacks and tarantulas! There are orb spiders, jumping spiders, crab spiders, peacock spiders, and….the list goes on. They each have their own personalities just like humans, and they each live differently, eat differently and even mate differently! If you are just as fascinated about them as I am, then why not join me on my journey of spider discovery? Maybe you’d like to have one of my originals on your wall? It would definitely be a talking point with your friends and family! I also love pigs. They are such intelligent beings – as intelligent as dogs actually – and I am so sad that people choose to eat them. The vegan in me has a particular need to show the world how beautiful pigs are – both their looks, and their personalities. I am horrified at how cruel humans are to pigs, particularly when it comes to factory farming! These gorgeous creatures deserve so much love and understanding and my hope is to show that to the world through my art. 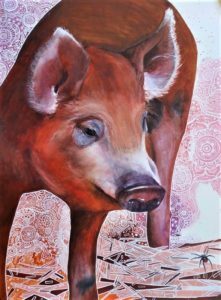 You’ll find that many of my paintings combine both subjects – pigs and spiders – and this has been inspired by the 1952 book “Charlotte’s Web” which was a favourite of mine when I was a child too. I will be forever grateful to the author E.B. White for bringing kindness to the world so long ago. Keep an eye out for my new paintings, and subscribe to my newsletter to be updated with my latest news which includes paintings for sale, and information about my classes and exhibitions. Watercolor is my preferred medium. It is amazing at how much you can do with watercolour and how much undiscovered territory there is with this medium! 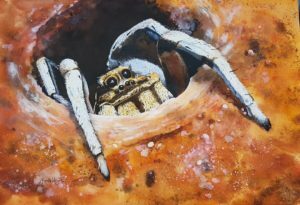 I combine my passion of painting spiders and pigs with teaching others to enjoy the world of watercolour too (where we also paint normal subjects like landscapes and flowers)! My painting classes and workshops are held in the northern suburbs of Perth. I enjoy watching my students travelling on their own watercolor journey. I’m also pleased to write that all the products I use are animal friendly and don’t contain animal products. I am a member of the Watercolour Society of WA, where I have made many lovely friends and gained so much valuable art knowledge. Please visit my other pages to view my gallery, and to get more information about classes, workshops, my influences, and how to subscribe to my regular newsletters.